This tray dates to Prohibition and was a “near-beer” produced by Anheuser-Busch in place of Budweiser beer. A “near-beer” had less than 0.5% alcohol so it could be served without breaking the law. 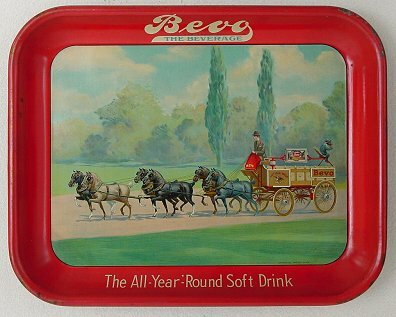 This tray features a familiar Bud-style scene with horses pulling a wagon loaded with Bevo.